Bariatric surgery works to change the size of a person's stomach, thereby limiting the amount of food he can eat and digest. Because the stomach size is made dramatically smaller during surgery, a person loses weight simply because he is not capable of eating the quantity of food he previously ate. 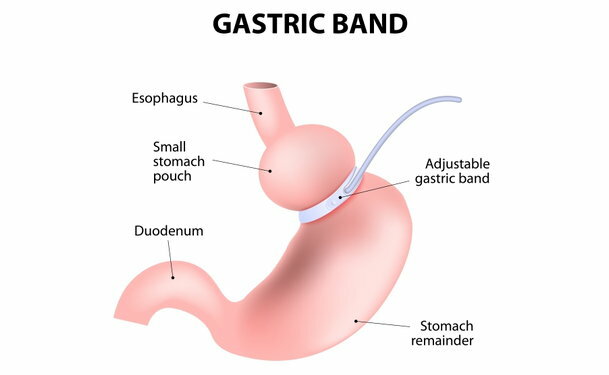 Gastric bypass (also called gastric band) is the preferred type of bariatric surgery among most surgeons. This procedure is done under general anesthesia. The surgeon creates a walnut-sized pouch at the top of the stomach. The pouch is sealed from the rest of the stomach and the intestine is attached directly to the pouch. For the surgery, you will have a tube inserted through your nose down to your stomach. This is for drainage purposes so that the stapled area can heal, and the tube may need to remain inserted overnight. The surgical procedure itself will last about four hours. However, you will likely need to stay in the hospital for about three to five days. Eating will not be allowed for a few days so that your stomach can heal. Then, you will have a very specific diet to follow for the next 12 weeks, progressing from liquid foods to pureed foods and soft foods before you are allowed to eat solid foods. In the first few months, you may experience body aches, fatigue, dry skin, hair thinning, and mood changes. The cost will, of course, vary depending upon the facility at which you have the surgery and your particular surgeon's fees (among other factors). Expect the procedure to cost between $25,000 and $35,000.